Real Estate is our passion, we love meeting with people and helping them to achieve their real estate goals. Whether you’re buying or selling property, we want to assist YOU! Relocating to the Lake of the Ozarks is a wonderful choice, with our beautiful views of the Lake, and many great year long activities, we know your family will enjoy it here. Here are a few featured listings that would make a perfect home. Meticulously maintained with all of the Four Seasons amenities. features, soaring ceilings, open floor Plan, main level living, and cove protected with main channel views. You will absolutely fall in love with the screened in porch just off the kitchen or with the views you’ll enjoy while entertaining from the tiled and covered decks. Suitable for a large family or someone who is looking for multiple living areas to have fun or just relax. This house has 2 master suites, with 5 bedrooms in total. A dining room and ample storage space highlighted by a 900 sq. ft. storage area. This is a complete package including the dock in a deep water cove. Looking for quality? Look no further. This all brick and cultured stone home lays beautifully within two professionally manicured gentle lots on a cul-de-sac street. There are no details left behind. In fact, you ll find craftsmanship throughout this sprawling estate home. An exceptionally designed floor plan enables you to enjoy the comforts from within while enjoying the captivating lake views this setting has to offer. The outdoor entertaining area; heated lakeside pool and summer kitchen area is just an example of how well the home embraces its natural setting. How often do you find a home where ALL of the important attributes are showcased? A gentle lot, deep water, spectacular view, great neighborhood, level driveway, and energy efficient. 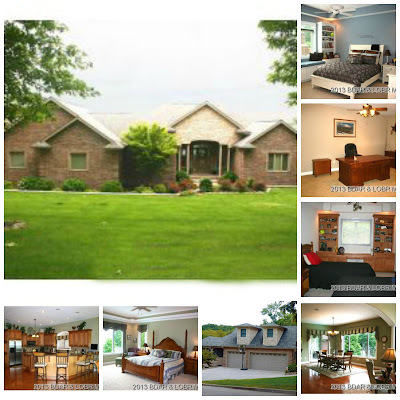 This home has everything you need when looking to buy a home at the Lake of the Ozarks. At Keys to the Lake Real Estate, we believe that both buyers and sellers are best served when dedicated and market-savvy professionals put their client’s satisfaction before all else. Our attention to detail and pure determination to indulge our client’s with first-class service is what sets us apart. We know that every transaction represents the most important purchase or sale a person can make, and we work hard to ensure that communication is impeccable with all parties involved from beginning to end. If you are considering buying or selling a home in the Lake of the Ozarks area, or would like to have additional information, please call or e-mail us today.